In 1960, racer Mickey Thompson brought the Challenger I to the Bonneville Salt Flats and set a one-time speed of 406.60 mph, making him the first American racer to break the 400 mph barrier. This weekend at the same place, his son Danny Thompson—in Challenger II, another car his father built—set an astounding new record of 450.9 mph in the timed mile record he came to achieve. This is a big part of what I came here to see. Barely minutes after the driver’s meeting concluded Saturday morning, Danny Thompson was already in his 50-year-old streamliner first campaigned by his father, the late Mickey Thompson. I had to wait until that meeting had concluded to get my photography vest for the day, and as I was stepping up to the table, I heard the incredible rip of a pair of engines screaming across the wide open salt flats behind me. The streamliner is an incredible mechanical specimen with a pair of 2,500 horsepower nitro-fueled dry block naturally aspirated Hemi engines aboard, one powering each axle to provide four-wheel drive. One engine sits ahead of Thompson’s cockpit, while a second rides behind. The car, all told, weighs an impressive 5,200 pounds. The weight, along with the giant tail fin, helps with high speed stability. 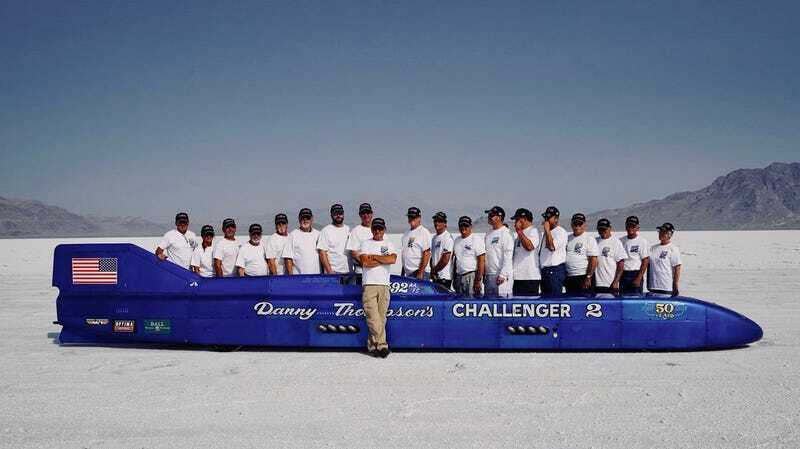 Danny Thompson and the Challenger II were perhaps the second or third car to run on the opening day of Bonneville Speed Weeks. On his first run of the day, he’d set a new world record qualifying time with a speed of 446.605 mph. When Mickey Thompson brought Challenger I to the salt flats in 1960, the rulebook required a back-up run to solidify your official record, and the machine broke down on the second run. Mickey Thompson returned to Bonneville with Challenger II in 1968, aiming for more, but the rain came and washed out the salt for that year. When Mickey and his wife were murdered in 1988, Danny put Challenger II in mothballed storage for 15 years and didn’t give Bonneville a second thought. Danny has been racing since he was in quarter-midgets at age nine, and it was only a matter of time before he returned to the land speed record game that made the Thompson name legendary in motorsport. Two years ago, Danny Thompson brought Challenger II out of retirement to set the Southern California Timing Association record for the “unblown fuel streamliner” class—meaning it is a naturally aspirated fighter-jet-looking-thing using non-standard fuel, in this case 30 gallons of nitromethane—at 406.70 mph, nearly exactly what Mickey had run in the Challenger I. That wasn’t good enough for Danny, knowing that the Challenger II had more speed in it. One thing that I heard a lot today was that “the salt is good this year”, and that’s been proven by the fact that a few dozen cars were in impound Saturday night, having set record-qualifying runs on their first day, including Danny. By the rule set, if you run a time faster than the class record, your car is immediately impounded and has to back it up with a speed the next day. First thing Sunday morning, Danny was back out on the salt to set another record-beating run, this one faster than his qualifier. The fourth car out on the salt Sunday morning, Danny set an impressive 450.9 mph speed in the fifth measured mile. The two speeds are now averaged to give the final record of 448.7 mph. While Danny already owned the class record, he was aiming to exceed 439 mph, which he did handily. That 439 mph target was the standing world record for piston-engined wheel-driven cars, which until today was held by George Poteet’s Speed Demon. Poteet has run as fast as 461 mph at Bonneville, but has not been able to back up his time in the 2200 horsepower turbocharged small-block V8-powered streamliner. Poteet was having technical issues on day one, and could not get in a representative speed. If you’ve never been to Bonneville, put it on your bucket list, because incredible things happen out here.